I wish you that the sun shines for you on your birthday. I wish you that you are loved by a whole heart. A family which stands to you, I wish this you. I wish you somebody who quite tightly takes you into the arm. I wish you that nobody leaves you in the lurch. I wish you, that you never feel lonesome because somebody always is there, who convinces you of the opposite. I wish you that you are comforted, if you are sad. I wish you a dream, for which it is worthwhile to fight. Simsalabim, I wish you that sometimes you have magic powers. I wish you a compliment which you would never have expected. And I am sending you my angel, like every year, now. Happy birthday both of us! Happy Birthday Thomas!! I hope it's a great one! Happy Birthday! May you have the best of all days with all your loved ones, filled to the brim with love and happiness. Wish you a great summer and good luck with CM season 8! Happy birthday. Enjoy your day with your family and friends. Happy Birthday Thomas! Enjoy a peaceful day with your family and friends. Looking forward to the new season! Happy Birthday to you, happy birthday to you, happy birthday dear Thomas, happy birthday to you! May you have an amazing day with your family and friends! Wish you all the best, both in your professional life and your personal one. Live long and be happy! Thanks a lot for the good times! Love from a little corner in Mexico City. Happy birthday Thomas! Have a great day with your family and friends!!! Wow I would have never in a million years thought you were older than me :) I hope you are having a wonderful birthday surrounded by those who mean the most to you!!! Happy Birthday! Happy Birthday Thomas, from the UK. Not the whole of the UK, you understand, just me IN the UK. Enjoy every minute of your birthday and ignore the fact you are getting older, cos you don't look it. I wish you the very best!!! I whish you and your family all the best. You are a great Actor and I'm sure that you are a great person, too. ( I never meet you, so I only can speculate). Have a nice day, and a lovely 50th. Have a wonderful birthday. You are my favorite on C.M. Just think, your'e not getting older, just better. Cannot wait for Season 8. Really enjoy ALL of your co-stars. HAPPY Happy Birthday Thomas hope that will be perfect!! !..and wow you look good man!! Happy Birthday, Thomas! 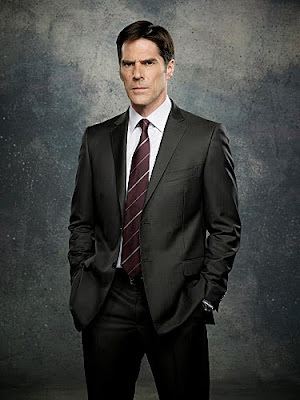 Can't wait to see SSA Aaron Hotchner back in action! Happy Birthday, sir - thanks for being you! Happy, happy birthday. I hope you have a totally awesome day! Happy Birthday. You're a wonderful actor. I hope you continue to grow in your on air role as well as in your personal life. Hope you have a great day! Happy Birthday from Liverpool , England have a great day !!!!!!! You deserve every success coming your way. Hope you and your family have a fantastic time. Your an inspiration to many and a credit to CM. I wish you and your family the best of luck and health. Thomas,stay just the way you are!! Sending Birthday Wishes for a wonderful & blessed Day! We love you on CM & can't wait for the new season! Happy birthday! Have only joy, happiness , and good fortune . A wonderful life for you and your family always. Happy birthday sir and I hope that you have a great day. I love you on criminal minds and look forward to the next season. HAPPY BIRTHDAY T.Gibs! Thank you for for your contribution to cm after all these years. The show would not be the same without you. Keep up the good work. I hope you gave a great birthday. Happy 50th Birthday Thomas. Hope You have a wonderful day with your family. Season 7 has just finished here in New Zealand really looking forward to season 8. You look great for being alive 50 years. I do hope the day is great and fulfilliing all your wishes. Also, have a great Independence day. Happy birthday! Thank you for continuing to entertain us each season. Happy Happy Birthday Thomas.i hope you have a great Bithday.and many more to come. Happy 50th Birthday! I hope you have a wonderful birthday with your family and friends. Happy Birthday Thomas! Hope it was a fabulous one for you. I'll be hitting that one soon too! Thank you for entertaining us all on Criminal Minds. You are a great talent! Happy Birthday, Thomas! I hope that you enjoy your day whatever you do. I hope that your family is well and that all of you are happy. Thank you for being my knight in shining armor every time I watch Criminal Minds. Happy birthday Thomas, hope your day is filled with much love and laughter and your surrounded by family and friends on this special day. Have a great one. From a huge Aussie fan of CM & cast. I wish you a great Birthday with lots of fun, sun, love and gifts! Have a nice day! ois guade und lass kracha! I wish you have a Happy Birthday and enjoy your love one. Congratz on the big five-0. As it was said in season 4, episode 24 (Amplification) "May you live a hundred years" (~ SSA Rossi) and more! Happy Birthday! I wish you the greatest of happiness! May the sun shine, the birds sing, and may you always feel blessed as an actor, for have talent! Criminal Minds would not be the same without you, so thank you for bringing your talents and skills to the show! Wish you all the best. Have a great day with your family and friends. Can't believe that you're turning 50! Where did the time go? Looking forward to CM and a thrilling, action-packed season 8. Miss watching it at 3am German time. Have an amazing birthday, free from twitter. But make sure you come back with plenty of strange pics for your fans, even feet. I think you're an amazing actor, and you deserve all the best for your hard work! p.s. Tom Cruise is totally stealing your birthday thunder. You only turn 50 once. Go crazy! Happy Birthday Thomas. Have à great day. Happy Birthday, Thomas! Enjoy your day with your family and friends. Happy Birthday to you! I hope you have a wonderful day and a fantastic year. I can't wait till Season 8. I love Criminal Minds! Happy Birthday Thomas! Have a fantstic day with your loved ones! All the best from Wales. Dear Thomas, have a great day and enjoy every minute of it, together with your family and friends! Happy Birthday Thomas Gibson! Wish you all the best! - Erika U.
hey guys, go vote for criminal minds with me on twop.com for the Tubey Awards. it'd be an awesome present for Thomas! Hotch and Reid are my favorites. Hope that it was a wonderful celebration for you as you turn the big 50!! Many happy returns for the year a head. Now you can become a member of AARP! Happy Birthday!